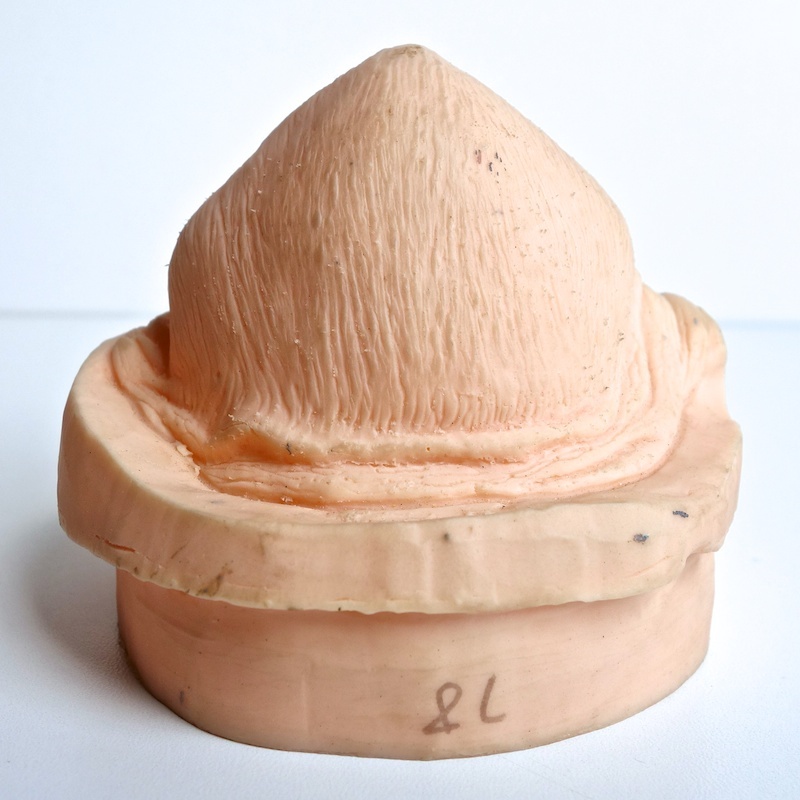 This might not look like much at first glance, but it’s actually a prototype used at Kenner when they were trying to figure out how to make the vintage Jabba the Hutt figure. 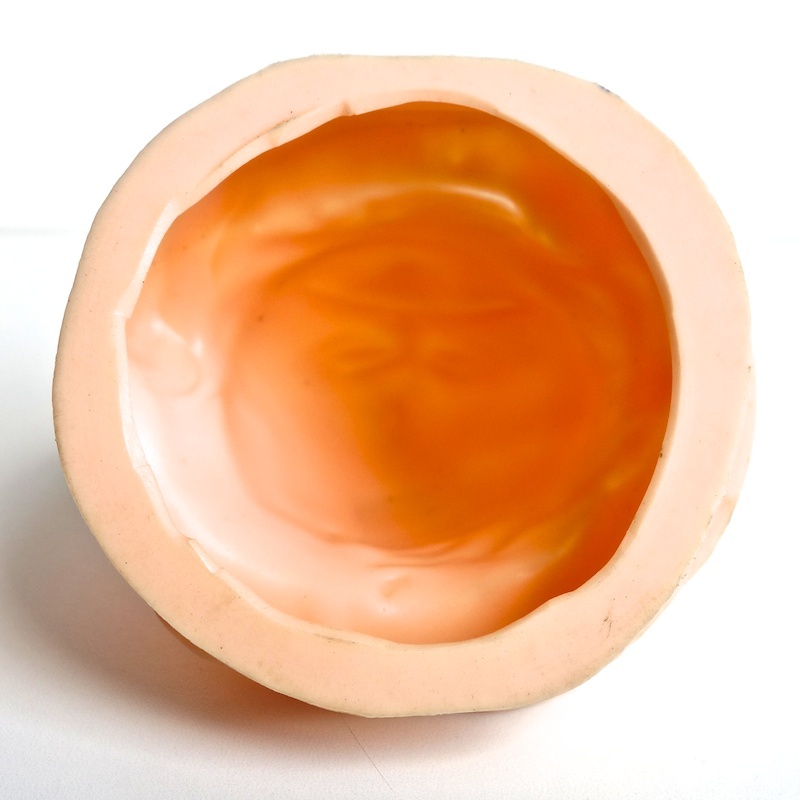 It’s made of hollow “flesh” colored vinyl and would have been made using a rotocast mold. It’s got quite a bit of excess vinyl on the bottom that would’ve been cut off if they had actually used these parts to assemble a figure. I don’t think they were ever planning on releasing anything directly based on this sculpt — it’s not up to their standards in terms of style or level of detail. Think of it as a sort of “sketch” or stand-in that they would’ve used while figuring out some of the logistics involved in the designing the toy. 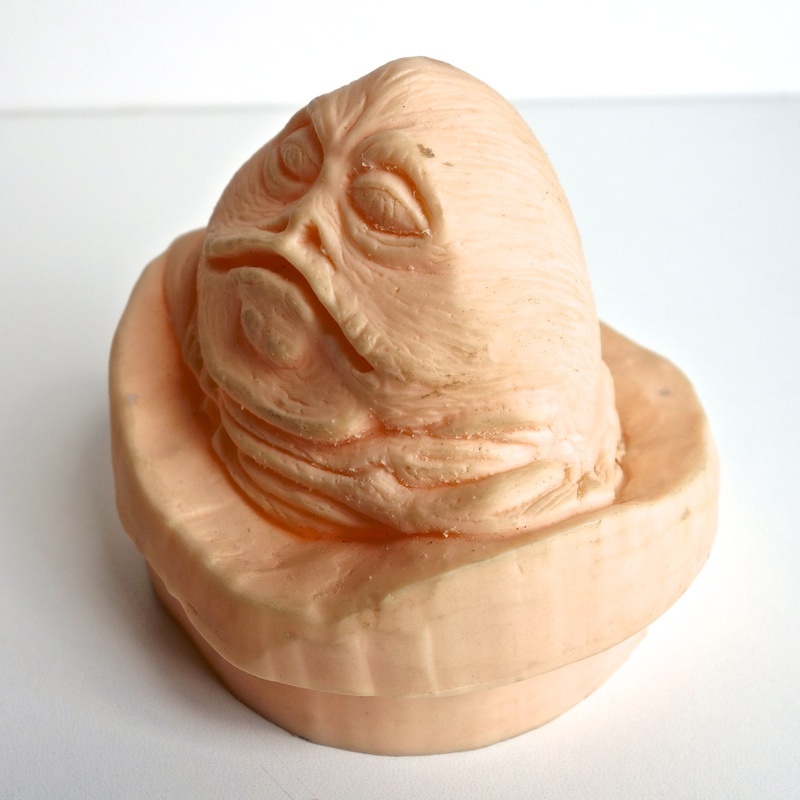 This prototype and others like it would have been the very first Jabba toys ever made. 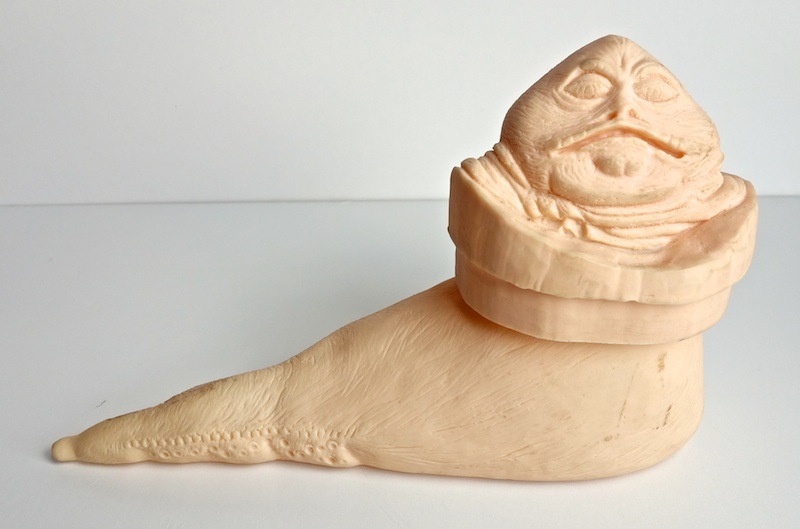 In fact, I suppose they’re the very first Jabba sculptures of any kind, aside from the maquettes used in the production of the Return of the Jedi. You can see a similar prototype on the Star Wars Collectors Archive, and on page 161 of Gus and Duncan’s Guide to Star Wars Prototypes. 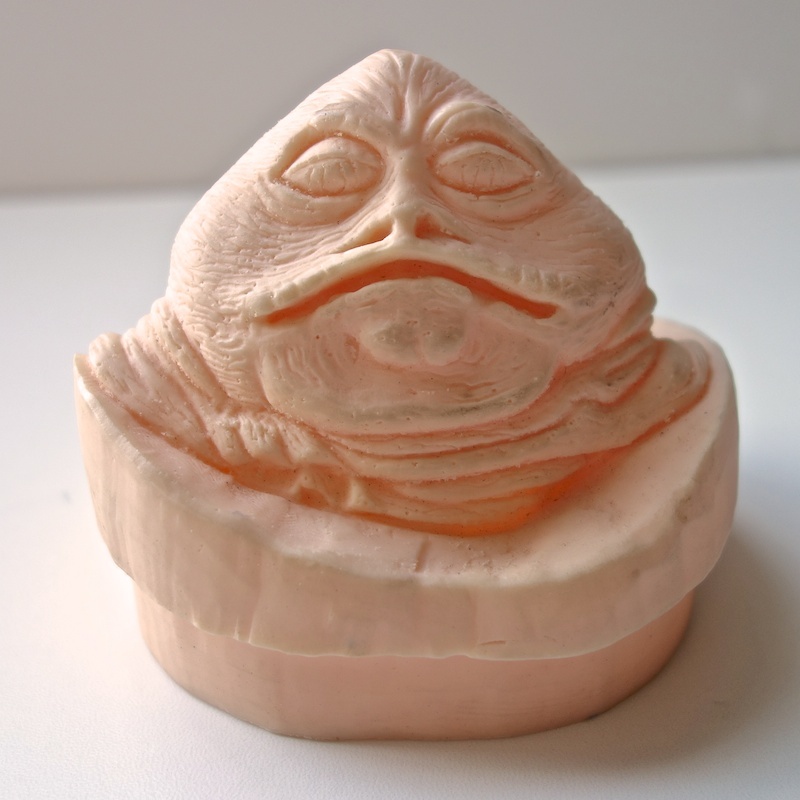 The final version of the vintage Jabba figure did indeed use a rotocast head that wasn’t too different from this one in basic concept, but the sculpt was completely different. Below are the two pieces fitted together. They look kind of weird because of all of the excess vinyl on the bottom of the head sculpt, but you sort of get the idea. And here it is with the production figure. It’s roughly the same size, but you can see the difference in the quality and detail of the sculpt. 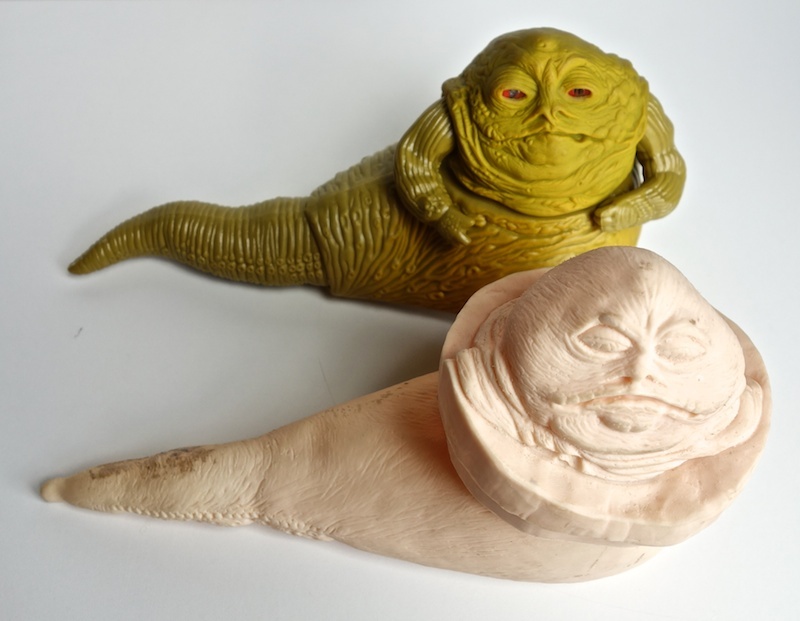 Below are a couple of shots from the SWCA showing a painted version of a prototype Jabba figure created using this sculpt. All of the pictures of assembled prototypes I’ve seen seem to use hard plastic rather than vinyl, so it may be that they gave up on the idea of a completely rotocast figure fairly early on. I wonder if one reason for this was that they wanted to incorporate the action feature in the toy. You can see where they have separated the tail into two parts, presumably to make the feature possible. 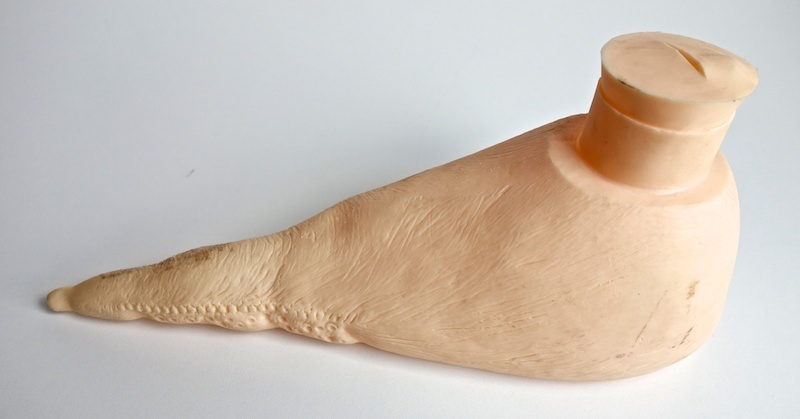 You can also see that it appears to have plastic eyes, similar to the actual figure. Also note the throne, which is quite different from the final one. And here is what appears to be a more polished version. 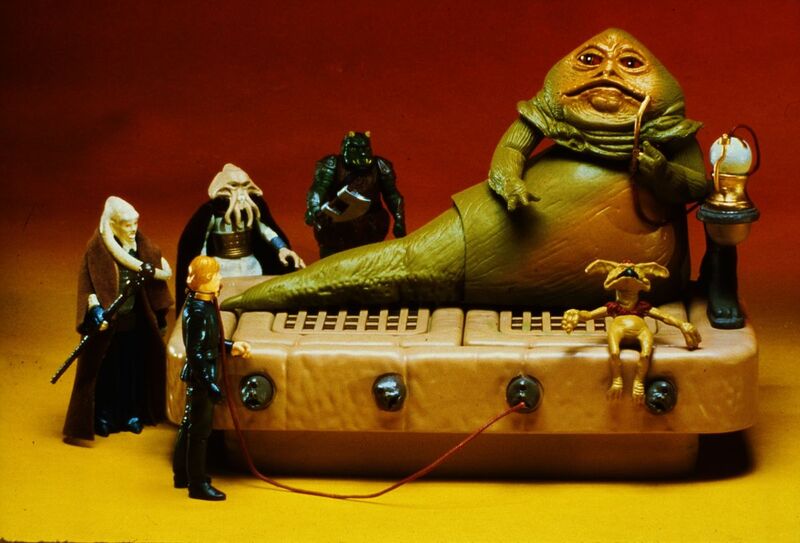 (This picture is from a post at “Home of Boushh” and is from a Kenner slide — I’ve cropped and flipped the image since the image of the slide was reversed.) The paint and overall color scheme is more refined, and the throne appears to be closer to the retail version, although still different. Salacious Crumb is also different from the final version. Unfortunately, it seems that no one knows what happened to either of these prototypes. I would of course love to have them in my collection. But even things like my raw vinyl prototypes are incredibly rare, as very few were made and those that survived were snapped up by collectors years ago. I’m very happy to have tracked them down. 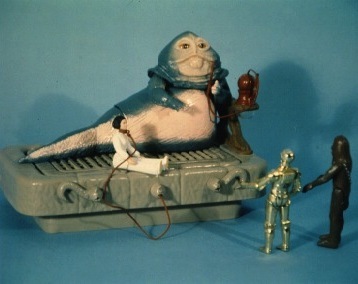 It’s so great that you’ve managed to track down these pre-production items of Jabba. I shudder to think how much they cost you. A Salacious Crumb pre-production piece would be an amazing addition as well, I hope you can track down a first shot or something like that.